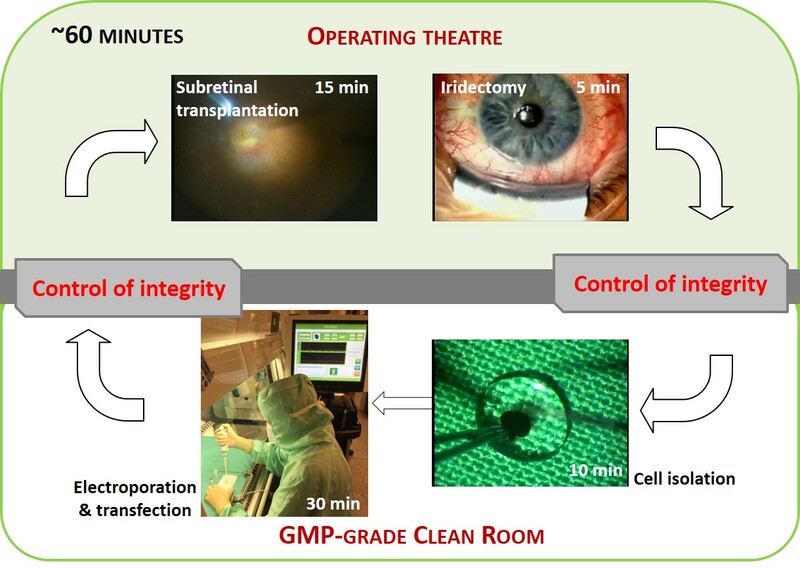 The TargetAMD protocol developed for the treatment of patients suffering from exudative AMD will consist of the isolation of autologous IPE (clinical trial, phase Ib / IIa, Switzerland) performing a well-established surgically procedure (iridectomy biopsy). By a GMP-grade in-house production, the isolated cells (5’000 – 10’000 cells) will be transfected ex vivo via an electroporation procedure, genetically modifying the cells by a PEDF-encoding plasmid using the SB100X transposon system. The transfected IPE cells will be implanted subretinally, completing the approximately 60 minutes lasting one-session surgical procedure. Fig. 1: TargetAMD therapy protocol. Harvest, iIsolation, transfection and transplantation of autologous IPE cells will be accomplished in one surgical session. The success of CNV inhibition by anti-VEGF treatment and the proven safety of autologous pigment cell transplantation will be combined and translated into a novel therapy. Autologous IPE cells over-expressing PEDF, will be transplanted subretinally to deliver a life-long solution for the patient. This project has received funding from the European Union's Seventh Framework Programme for research, technological development and demonstration under grant agreement no 305134.